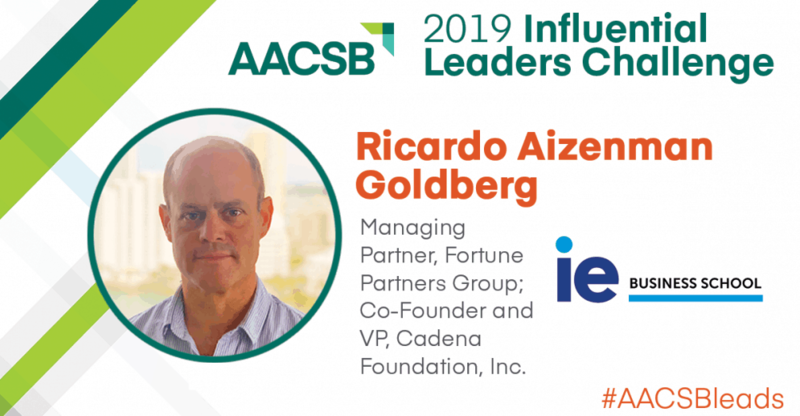 IE Business School alum Ricardo Aizenman Goldberg is one of 33 honorees named to the 2019 Class of Influential Leaders by AACSB International—the world’s largest business education alliance. The annual challenge recognizes notable alumni from AACSB-accredited schools whose inspiring work serves as a model for the next generation of business leaders. In 1998 Aizenman left his job to pursue his International MBA at IE. Today, he is the Co-Founder of Cadena International Hub in Miami, a humanitarian aid relief organization dedicated to providing assistance in emergencies and natural disasters. Cadena has helped, with many others, 800,000 people in more than 300 humanitarian aid relief missions worldwide. For this he was selected as an AACSB Influential Leader 2019 honoree. Read his full story here. AACSB is honored to recognize Ricardo Aizenman and applauds his achievements at Cadena as a leading example of business education as a force for good in the world. In its four years, the Influential Leaders challenge has recognized almost 200 business school graduates for creating lasting impact in business and society. All honorees are have earned an undergraduate, graduate, or doctoral degree from one of the more than 800 AACSB-accredited business schools worldwide.